9: Milwaukee record for pitchers used in 17-inning win over Arizona on Sunday. 94: Runs Houston has scored from 7th inning on, most in baseball. With Prince Fielder leading the league in hitting and former MVP Josh Hamilton already having an impact in his Texas reunion, the Rangers have a winning record for the first time in nearly a year. The Rangers capped a magnificent month with Hamilton’s game-ending two-run, two-out double as a pinch-hitter after starting May with a loss for a 7-15 record that was the worst in the American League. At 26-25 to open June, the Rangers are above .500 for the first time since being 31-30 last June 6 in a season that ended with an A.L.-worst 95 losses. 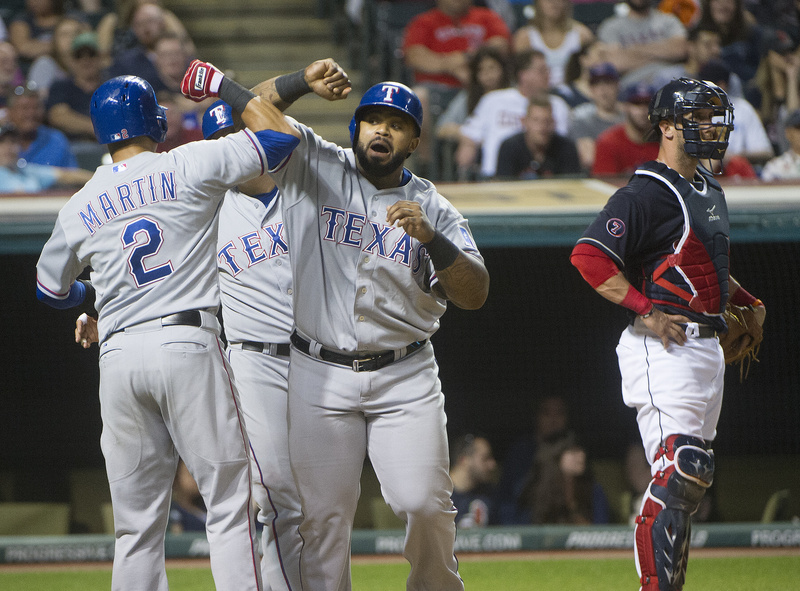 Texas hit a majors-worst .210 the first month, and scored only 75 runs. The Rangers scored more than twice as many runs in May, when .359 hitter Fielder started going deep again (nine homers after only one before that), Shin-Soo Choo batted .295 for the month (after .096 to start the season), rookie Delino DeShields had an A.L.-high 10 stolen bases and Hamilton rejoined the team a week ago and swatted two homers on Sunday. The Rangers, with Monday off to start June after only one off day in May, have won 19 of their last 29 games and four series in a row. They took three of four games from Boston for their first series win at home. After losing to the Cubs, Miami optioned Steve Cishek to Double-A Jacksonville. He lost the closer’s job two weeks ago and is 1-5 with a 6.98 ERA in 19 games. “We want to take him out of the spotlight of the major leagues and let him work on some mechanical things,” Marlins manager Dan Jennings said. Toronto’s game at Washington was postponed and will be made up today as part of a split doubleheader. … The Minnesota game at Boston was also postponed with a twin bill set on Wednesday. … The Brewers have activated Jonathan Lucroy from the 15-day disabled list after the All-Star catcher missed about five weeks with a broken left big toe. … Chris Capuano will be the odd-man out of the Yankees’ rotation, going to the bullpen when Masahiro Tanaka returns this week. … The Rangers are calling up top prospect Joey Gallo, 21, after putting Adrian Beltre on the DL. … Miami ace Jose Fernandez took another step in his recovery from Tommy John surgery, throwing three hitless innings in an extended spring training game. … Washington recalled pitcher Felipe Rivero and optioned pitcher Matt Grace to Triple-A Syracuse. … The Dodgers transferred Carl Crawford to the 60-day DL because of a lingering strained oblique injury. In addition, the Dodgers optioned right-hander Matt West to Triple-A Oklahoma City and selected the contract of left-hander David Huff from Oklahoma City.